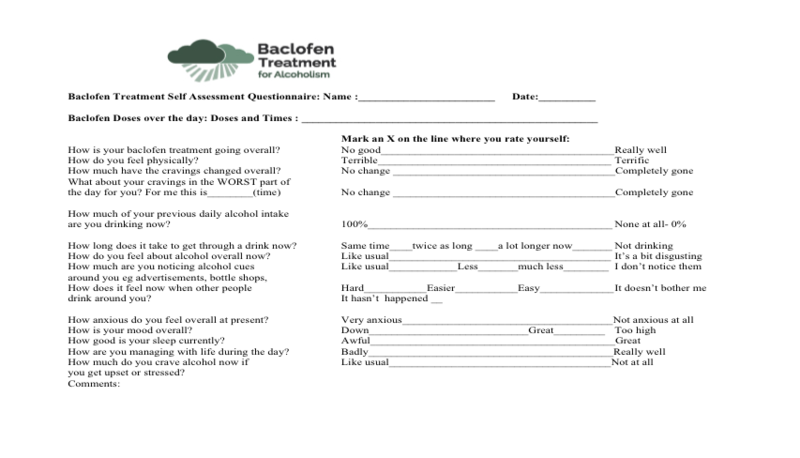 This is a practical guide to Prescribing Baclofen in Alcohol Addiction. All the information in this module is available in written form including protocols for prescribing and dose adjustment and an information pack to give patients (link). SECTION 2: The key effects of baclofen on the Alcohol Addicted patient. Baclofen’s main effect in the treatment of alcohol addiction is that it switches off alcohol cravings – the compulsion to drink. The aim is to totally switch off cravings so that the patient experiences an effortless indifference to alcohol. This is a remarkable experience for the alcohol addicted patient – the ability to be in the company of others drinking alcohol and not feel tempted, the ability to pass blithely by liquor stores and not be “sucked” inside. It’s such a powerful effect that the patient doesn’t need to stop drinking or go through detoxification to start baclofen treatment – once the cravings stop, the patient has the choice of whether to drink and generally their alcohol intake simply drops away. Added to this is baclofen’s powerful anxiolytic effect. Anxiety is often the root cause of treatment resistant alcohol addiction so this is a very beneficial effect. The common link between anxiety and alcohol addiction is explored in more detail in another section (link). I think of it as the missing piece of the puzzle as to why many alcohol addicted patients just can’t stop drinking. Baclofen is the only medication widely used for alcohol relapse prevention which has inbuilt anxiolytic effects – acamprosate and naltrexone don’t have any. There has been increasing interest in a couple of other medications with effects on anxiety and alcoholism, topiramate, gabapentin and pregabalin but none match the reliable effectiveness of baclofen. Benzodiazepines like diazepam are very effective for anxiety, in the same way alcohol is but they’re not a great treatment. They share the same addiction risk because of the rapid onset of tolerance and the need for increasing doses. The result is often exchanging an alcohol addiction for a benzodiazepine one. Importantly baclofen’s anxiolytic effect starts at low doses, often well before the anti-craving effect kicks in. This encourages patients to stay on the baclofen while it’s being titrated up because they can feel a beneficial effect on their anxiety from the start. With baclofen having both anti-craving and anxiolytic effects, it can be hard to work out which is having the most effect on reducing alcohol consumption but, to my way of thinking, this is of intellectual rather than practical interest. SECTION 3: Individualised dose titration is required. FIGURE 1 | Maximal dose taken by patients, with the number of patients for each maximal dose. This graph is from the 2012 paper by de Beaurepaire– it’s discussed in the Science section, Clinical Trials of Baclofen in Alcoholism(link). The paper describes the results of 100 baclofen treated alcoholics over a 2 year follow up. This graph shows the daily dose of baclofen required to switch off alcohol cravings. As you can see this varies greatly, from 30 to 300mg per day. It’s important to understand that these are the maximum doses required by the patients to switch off their cravings. Most patients who require high doses of baclofen to switch off their craving can reduce the dose down to a lower maintenance dose. For example, Olivier Ameisen (link), who discovered baclofen for this use, required a dose of 270mg/day to switch off his cravings but after a couple of weeks reduced the dose to 120mg per day, 40% of the original dose and stayed there for the remaining 8 years of his life. There is no way to predict the dose of baclofen required in advance. It’s helpful that patients understand how variable the effective baclofen dose can be so that they are not disheartened if lower doses have little or no effect on their cravings. Start low and titrate slow. This is very important because baclofen’s side effects are largely determined by the speed with which the dose is increased. Patients are naturally eager to increase their dose rapidly but this often leads to unpleasant side effects which are avoided by a slower rise in dose. The slow initiation to get to 30mg/day over the first 7-10 days gives a good indication of how susceptible the patient is to side effects. Those who pass through the initial steps with few effects can then have a rapid titration upwards from there. Patients who experience a lot of initial side effects will require a slower titration to allow them to reach their effective dose. A standard initiation regime is shown in section 8. The side effects are usually mild and transient. The most common side effects of baclofen are nausea, dizziness, sedation and sleep disturbance in the first few days after starting the baclofen. These and other side effects generally fade away over 1-3 days but often reappear again at further dose increases It is unwise to increase the dose while side effects are still present – simply continue the same dose until the side effects are gone, wait a few more days then continue to titrate the dose up. Patients may be alarmed at the side effects when starting baclofen but quickly come to recognise them as transient and harmless. Symptomatic treatment can help side effects. For nausea and dizziness, prochlorperazine 5-10mg 6 hourly prn works well. Most alcohol dependent patients already have disturbed sleep and baclofen can make this worse if given too late in the day, but in either case it generally responds to mirtazapine 30mg at bedtime. Baclofen has a very wide variety of other possible side effects, some of which are quite odd. They include tinnitus, muscle aches, morning headaches and rash. There’s a detailed discussion of baclofen side effects in another module of this section. These unusual side effects generally appear when the baclofen dose reaches the higher ranges eg over 100mg/day. They too disappear with continuing treatment at the same dose. However for unpleasant or poorly tolerated side effects, the baclofen dose should be reduced back down to the previous dose without the side effect and left there for a week or two before then increasing the dose again but more slowly. Some side effects can distress patients greatly and lead to them refusing to continue the baclofen treatment despite reassurance. The patient should be slowly weaned down rather than stop abruptly. Patients who have been taking baclofen for more than about 2 months can get a withdrawal syndrome very like that of alcohol withdrawal (link). Others have not been on baclofen long enough to get withdrawal but find their anxiety and cravings re-emerging off baclofen. Patients can be assured that baclofen does not cause any permanent effects – any side effect which occurred on baclofen therapy will disappear once the baclofen treatment has ceased. However it is far more common for patients to endure really quite unpleasant side effects in order to continue baclofen treatment because of the beneficial effects on their cravings and anxiety and their strong desire to finish with their alcohol addiction. There is more detail on this in the Side Effects of Baclofen and their Management section. Explanation and Setting Expectations are important. Some patients seek baclofen treatment having done a lot of research and are already well informed. They may have read Olivier Ameisen’s book on how he discovered baclofen for his alcohol addiction or have searched the internet for scientific papers, baclofen forums or blogs. Other patients will ask for baclofen treatment knowing very little about it. There is a starter pack of information for patients in the Resources section of the website (link). I encourage patients to search out information and become well informed about baclofen treatment for alcohol addiction. They can find a range of information on this website as a starter and the Resources Section (link) has links to other baclofen resources and information on the internet. When starting baclofen, it is very important to set expectations around the time frame of treatment. Some patients come with an expectation that baclofen will “cure” their alcohol addiction within a day or two of starting. Others will try to accelerate the dose increases of baclofen “to get there faster” with the risk of unpleasant side effects. Patients need to understand that it generally takes a number of weeks and sometimes months to reach the dose required for full effect on alcohol cravings. Most patients experience a gradual, progressive reduction in cravings for alcohol as the baclofen dose increases but for others there’s very little effect until their effective dose is reached when their cravings suddenly switch off. Maintain the alcohol intake steady to start with. The simplest way to use baclofen is to keep the alcohol intake stable to start with and watch the effect on alcohol cravings and alcohol intake as the baclofen dose rises. The alcohol intake generally drops steadily and any withdrawal is avoided. In the case that the patient drops his/her alcohol intake too rapidly, baclofen will make any alcohol withdrawal symptoms much milder. If they do appear, the patient can take some extra baclofen to cover this or slow down their alcohol reduction. Diazepam should not be necessary. This is the most common way to use baclofen and it works very well. As the baclofen dose is titrated up, the pattern of cravings and drinking will guide how much the baclofen dose needs increasing. This regime is not advised in the frail, isolated or frequently falling patient with a constant high alcohol intake. The additive sedative effects of baclofen can be risky if the alcohol intake does not decrease rapidly enough. These patients are safer being detoxed in a supervised inpatient setting, ideally with baclofen started in the detox and then titrated in an outpatient setting. Some patients want to stop alcohol and make a clean break rather than titrate down. This is reasonable for patients who either can access an inpatient detox or are suitable for a home detox with a Baclofen Assisted Alcohol Withdrawal. Other patients present having stopped alcohol recently – they are in withdrawal and asking for help but their withdrawal is mild enough to be safely managed as an outpatient. They may also be suitable for a Baclofen Assisted Alcohol Withdrawal. This is described in detail in another section. *don’t raise the dose further if you still have side effects. Wait until they go then raise the dose again slowly. Here is a typical initiation regime which can be used to start baclofen treatment. This table is part of the Patient Starter Pack in the Resources section. It is a guide to how to do the initial titration but can be varied as needed for the individual patient. It is important that patients know that if they are getting unpleasant side effects, they should not increase the baclofen dose further until they are gone. Baclofen has a short half life and its effect lasts for 4-6 hours so it must be given as multiple dose over the day. The timing of the tablets should be adapted to a patient’s timetable and needs. A patient who rises late in the morning will space their three doses differently from one who is out of bed early. At this first consultation, it’s worth considering adjuvant treatments. Some patients need them and others don’t at this early stage. Patients with alcohol addiction usually have very poor quality sleep- they often use alcohol to get to sleep by rendering themselves unconscious but then wake several hours later and struggle to stay asleep. When they stop alcohol, the withdrawal and re-emerging anxiety often makes it hard to get to sleep before the early hours of the morning. And sometimes baclofen itself causes difficulty getting to sleep if the last dose is taken at bedtime. It’s better taken in the late afternoon. Poor sleep severely impacts patients’ resilience so I treat this actively. My first choice is mirtazapine, 15-30mg at bedtime. This sedating anti-depressant gives good quality sleep and has anxiolytic properties. It is often the first time for years that patients have been able to get a full and reliable night’s sleep. Mirtazepine can be safely combined with SSRI and SNRI anti-depressants if needed. Baclofen and mirtazapine is my commonest starting treatment regime. In some patients, this combination is not sufficient or suitable. If the patient has significant underlying anxiety or low mood, an SSRI/SNRI may be indicated although it will take weeks for the full anxiolytic effect. My commonest choice here is escitalopram but if another SSRI has been effective for anxiety for the patient, I continue or restart that one. The effectiveness of any one SSRI/SNRI is highly variable between patients so it can take trying a few of them to find a suitable one. I generally avoid fluoxetine because of the long washout period. The SNRIs like duloxetine, venlafaxine or desvenlafaxine can either improve or exacerbate anxiety but are very effective in some patients. At the first visit, I generally dispense the exact number of baclofen tablets required for the initial titration although this may not be practical in General Practice. This will be 10-15 tablets (with 6 tablets halved), depending on the timing of the next review. This prevents patients from accelerating the titration. The next review is at 7-8 days by which time most patients will be on 10mg tds, the minimum effective dose. On the first script, I also add prochlorperazine (Stemetil) for nausea/dizziness and any adjuvant medication such as mirtazapine for sleep. The patient can opt to fill the scripts for these only if needed. The first evaluation of the effect of baclofen in a patient will be at the 10mg tds or 30mg/day dose. There is a patient self evaluation sheet in the patient starter pack which can be brought to each consultation. Patients will generally have noticed some effect from the baclofen, generally on their anxiety and sometimes on their attitude to alcohol. For some patients, the change is dramatic, even at this low dose and their cravings for alcohol have disappeared. They can stay at this dose and see how things go. They should take an extra 10mg dose if they find themselves craving alcohol at times. It’s worth warning patients that some get a very dramatic early response but within a few weeks they will need to increase the dose again until they find their true effective dose. It’s a sort of “honeymoon”. I’ve seen it often enough to routinely tell patients it can happen. Most patients will need to continue to titrate up the baclofen dose. The easiest rate of increase is up by 5mg per dose (1/2 tablet) every 3-4 days, from 30mg/day to 45mg/day to 60mg/day etc. In talking with the patient, it is usually easy to work out if all doses need increasing or only some, by asking where the cravings are the worst. It’s usually in the late afternoon. Normally I review weekly during the titration stage but now dispense the baclofen in scripts of 100 tablets of 10mg. The short duration of action of baclofen, 4-6 hours, allows flexibility in how the daily dose of baclofen is taken, to suit patients’ needs. It also means that attention is needed to how the dosing is distributed through the day. For patients who crave strongly in the morning, the first dose of the day should be taken rapidly on waking up and will work in about 20 minutes. Others can wait until breakfast time. The last dose of the day can be at bedtime if baclofen’s anxiolytic effect helps sleep but others need to take the last dose around 5-6pm if baclofen causes sleeping problems. Watch for too great a gap between the afternoon and evening doses eg 6am, 1pm, 9pm. This will leave little cover in the high risk drinking times of late afternoon and evening. A better spacing of doses might be 6am, 12pm, 5pm: with the option of a bedtime dose also. The daily dose is split evenly over the day in 3 doses eg 7am, 1pm, 5pm. Two doses daily, the first on waking and the second on leaving work because the patient is busy at work and doesn’t crave then. This patient will often need three doses on weekend or holiday days though. Four doses: at each mealtime and bedtime because it is easier to remember and spreads the more dose evenly over the day. The “dinner” dose often needs to be taken late afternoon eg 4-6pm. Some patients fractionate their daily dose even more over the day to keep a smooth effect of the baclofen. This is often for the anxiolytic effect so these patients generally need a longer lasting anxiety treatment like an SSRI/SNRI. a patient who craves mostly in the morning takes a bigger dose on waking than the doses taken later in the day eg 40mg/20mg/30mg. A patients who drinks on arriving home from work may need a small morning and lunchtime dose and a bigger dose on leaving work or arriving home eg 30/30/50mg. I normally reinforce a couple of points with the patient at each follow up visit. They can take an extra 1/2 to one baclofen tablet if needed for cravings or anxiety. If needed frequently, the daily dose needs to be increased. And if the patient starts to drink heavily again, It is VITAL to continue to take the baclofen and seek help rapidly. This might mean staying in the sight of family or friends so that they cannot drink or seeing their GP. The quicker they seek help, the easier it is to stop again. A pre-determined relapse action plan can be useful to set out what they will do if this happens. In review visits, the key is the patient’s evaluation of their progress. The Self Evaluation Questionnaire assesses the key points I particularly look at in follow up visits. It’s in the Patient Starter Pack (link). It’s useful for the patient to fill this out before a consultation – to reflect on how treatment is going and where there are still problems. It’s a good conversation starter for the consultation and helps to guide baclofen titration and the need for other treatments. Because baclofen has both anti-craving and anxiolytic properties, both of these are assessed. For some patients, there are distinct feelings of cravings. Others have a more subtle pull to drink so other indicators like awareness of alcohol cues in their environment and their speed of drinking are more reliable. If the indices in this questionnaire aren’t helpful for a patient, then simply adapt or modify them. It’s about how much choice the patient has about drinking. Baclofen doesn’t MAKE a patient stop drinking alcohol; it gives them a choice again. Some patients chose to keep drinking alcohol in large or small amounts although they are aware that they don’t have to anymore. When effectively treated, many patients find the smell or thought of alcohol a bit disgusting. It’s not a strong reaction, nor a type of aversion. It is probably a more realistic assessment of alcohol with the addiction stripped away. There are two patterns of baclofen titration effect. The most common is a steady decline in cravings with the increasing baclofen dose until the patient has good control and they stay at that dose. The other is that there is little effect on cravings until the patient reaches a certain dose and their cravings switch off suddenly. Sometimes after the patient has been stable on their “switch” dose for a couple of weeks but then starts to get new side effects, especially tiredness. This generally signals that the baclofen dose can be lowered. The patient may be scared to do this but can go down slowly with the assurance that if their cravings start to reappear, they have found their lower limit. They just need to take the dose back up a bit above this, until they feel comfortably free of cravings again. Patients will judge their own level of comfort and where their dose needs to be. They may need to increase the dose temporarily in times of stress but as this settles, the dose can come down again. Over time the baclofen maintenance dose will stay steady with a tendency to slowly fall. In the case of Olivier Ameisen who discovered baclofen for this use, he required 270mg/day of baclofen to get control of his cravings but after a few weeks had increasing tiredness and cautiously lowered the dose to 120mg and stayed at this dose for 8 years, until his death in 2013. In France, treatment with baclofen has been going on for enough time to see that the average dose of baclofen required by patients decreases over time. In a study of 1085 patients carried out by the Association Baclofene, the average daily dose of baclofen decreased steadily from 121mg in the first year of treatment to an average of 77mg by the 4th year. 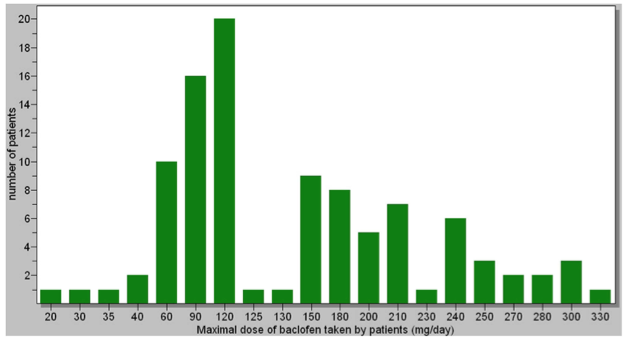 At this 4 year mark, 15% of the patients who were successfully treated with baclofen had stopped baclofen altogether and 38% were taking only low doses of 30-60mg/day. Only 6% were still on high doses of more than 150mg/day of baclofen. This variation is to be expected. Some patients will not wish to decrease their dose over time as they value the security against relapse and the anxiolytic effects of baclofen. Others will be keen to stop when they can. The issue of how long to stay on baclofen treatment is further discussed in another section. What is not seen with baclofen is a progressive increase in the dose required over time to achieve the same beneficial effect- the phenomena of tolerance. This is distinctly different from alcohol or benzodiazepines and is one of baclofen’s major advantages. The stability it brings allows patients to get their life back on track without creating a new addiction. It is likely that the neural networks driving the alcohol addiction weaken over time so the dose can be lowered. However the patient may still find baclofen helpful for their anxiety or just as insurance against relapse. This is important and I learnt it from my first baclofen patient. We were struggling with getting to the right dose for her. She was savvy enough to see which parts of her cravings the baclofen did and didn’t work for. I realised that what she was talking about was common as I treated more patients. Many alcoholic patients faced with a particularly stressful situation will have an almost reflex urge to drink. They describe drinking alcohol rapidly, without thought or control – “Before I could even think about it, I had had a drink.” I call it a “brain snap”. Baclofen doesn’t prevent this “reflex” urge to drink – it is an ingrained, learnt response for the patient. What baclofen DOES change is how they react to it. When the baclofen dose is sufficient, the initial distress and desire for alcohol still occurs but the patient has a distinct sense of distance from the urgency to drink and can think about and enact alternatives to drinking. For example “I feel stressed by this situation and really want a drink right now but that’s a bad idea and I don’t want to do it. Instead, I am going to distract myself and the craving will pass.” The patient might use breathing or relaxation techniques, take an extra baclofen tablet, go for a walk, ring a family member or friend or go to an AA meeting. Their control may be imperfect until they have the full effective dose of baclofen and have worked out their distraction techniques. As the baclofen dose increases, they often find that for the first time in their life, they can effectively use psychological techniques to settle these crises. Many patients have been taught them as part of previous treatments for their alcohol issues but can’t get them to work in times of crisis; their brain is too overwhelmed in the moment. But with baclofen giving their brain some time to reflect, the patient can take control. This is a great breakthrough for the many who feel powerless in the face of stress. So what’s important here is that the baclofen is not titrated up with the aim of suppressing every thought of alcohol – it’s ok to have fleeting cravings and cravings in times of stress which are easily controlled. The reaction to “brain snaps” – rapid, “reflex” drinking. Does the patient have the ability to think, reflect, decide, act to not drink? If yes, the baclofen dose is giving them enough control. If no, review what is happening. More baclofen can help if control is weak. It is helpful to reassure the patient that with time, the strength of the “reflex” urge to drink will decrease. This pattern has been learned over time so it takes time for it to be “unlearned” by the brain. Sometimes a patient will chose to drink in reaction to stress because it’s their usual way of dealing with it but they clearly recognise that they didn’t need to. They reflected on their options and could have done something else. They made a conscious choice. The baclofen is working. Baclofen doesn’t prevent the patient from drinking, it gives them the choice not to. We have some insights into how baclofen brings about this change. Another section of the website, How does baclofen work? discusses a fascinating paper which uses functional MRI to understand the effect of baclofen on addiction pathways. It shows why “brain snaps” occur and why patients on baclofen can effectively use cognitive techniques which didn’t work before baclofen treatment. It provides a neurobiological explanation for what my patients were telling me.